On December 6th, 1990, PEN hosted its annual benefit. The show-stopper that night was the following duet, performed by Canadian icons Robertson Davies and Margaret Atwood, accompanied intrepidly by Tomson Highway on piano. The 2015 PEN annual benefit will take place at the International Festival of Authors on October 22. A: With nothing to drink? A: So, maybe you’ll shrink? D: But can you grow a beard? D: That’s what I feared. 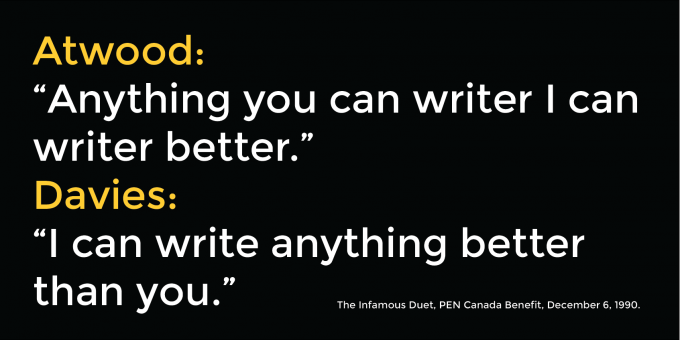 A: I can do both in verse! A:. All over the floor? D: Shore! And come back for more! Yes I am, so I am, so I am! D: I can be more diabetic than you! Both: Yes we can. yes we can, yes we can!